According to data released in 2017 by the United States Department of Agriculture, Maine is ranked as the seventh most food insecure state in the nation and the most food insecure state in New England. About 16 percent of residents, including one-fifth of children, lack access to the quantity and quality of food necessary for an active and healthy lifestyle. Every Saturday for the last seven years or so, Charlie Boothby has visited the Brewer Farmers Market to ask for free food. He never gets between the vendor and their customers — “You stand back out of the way until the customers slow down so that you can talk with the vendor,” he explained — but as a volunteer gleaner, who collects unsold produce and food products at the end of the weekly farmers market, Boothby is the key connection between farmers with leftover products and the people who need them. Once Boothby has the leftovers, he brings them to an area food pantries — usually the Ecumenical Food Cupboard at the Hammond Street Congregational Church, which makes the food available every two weeks for those in need to pick up and use. Boothby started gleaning when Kate Garland, a horticulturist at the University of Maine Cooperative Extension, was looking for volunteer gleaners for the aftermarket gleaning project, which was then an offshoot of Maine Harvest for Hunger. Boothby had worked closely with the cooperative extension for nearly four decades in soil and water conservation. He offered to lead the gleaning in Brewer. “I chose to do it in just one place, and I think it paid off because I got to know the vendors and farmers and they got to know me and we knew what to expect,” Boothby said. The aftermarket gleaning started in 2011 at the Orono Farmers Market and expanded to the Brewer and Bangor farmers markets in 2012 and 2015, respectively. According to Garland, the farmers markets gleaning has collected 74,203 pounds of food from the three markets since its inception. Though Garland used her connections through Maine Harvest for Hunger to organize and train volunteers, she said the idea to start a farmers market gleaning program was “the brainchild” of Tom Roberts, owner of Snakeroot Farm. 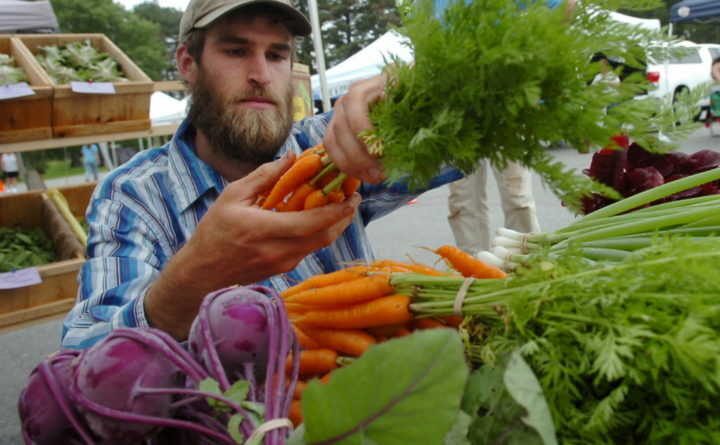 He helped Garland initiate the farmers market gleaning in 2011 at the Orono Farmers Market. Roberts began asking farmers what they do with their extra foodstuffs at the end of the day. He learned that while some produce is composted or fed to livestock, others were taking extra time after an already long day at the market to drop it off at a food pantry en route back to their farms. “I thought, ‘That’s nice, but there has to be some easier way of doing that,’” Roberts said. Roberts worked with Garland to find out which of the local food pantries had the ability to take fresh produce. Many of them did not because they were not equipped with refrigerators. But some, like the Crossroads Ministries Food Pantry in Old Town, which has a walk-in cooler to store fresh food, were equipped. Garland recently passed the Orono Farmers Market gleaning baton on to the Crossroads Ministries Food Pantry entirely. Though they may initially have to warm up to the idea, many farmers quickly realize that aftermarket gleaning is a win-win. “As a farmer, it feels good to bring in extra, and if it doesn’t sell to bring it to the gleaners,” Roberts said. He explained that when farmers know that gleaners will make sure their unsold produce is put to good use, they are willing to take the risk of bringing more to market to sell. Farmers market gleaning is different from in-field gleaning, which takes place at the farm itself. Roberts emphasized that “It’s not a rather than, it’s an also,” but there is advantage to the regularity of farmers markets. When conducting in-field gleaning, Roberts explained, you wait for the farmer to call you; aftermarket gleaning happens every week that the market is open. “Farmers markets are going to have things on a pretty regular basis,” Roberts explained. Volunteers like Boothby, who are willing to be at the farmers market every weekend, have been key to the program’s success so far. Boothby admitted that he tried and failed to get a group of volunteers together so that one person does not have to do it all the time. But Boothby cannot be a one-man show forever. “I’m 83 years old, so I think I’m ready to retire,” he said, even though he has found the experience worthwhile. “The most rewarding is getting to know the farmers because they’re a good group and they want to do well and this is an opportunity for them to share their wealth with those in need,” Boothby said. Any volunteers looking to help with farmers market gleaning can contact Garland through the University of Maine Cooperative Extension. Boothby will leave behind big shoes to fill. Garland said he has been instrumental to programs successes in the past and helped set it up well to grow in the future. He partnered with Garland to conduct an aftermarket gleaning training at a meeting of the Maine Federation of Farmers Market years ago to promote expanding the program beyond the Penobscot region.